CDs, then he puts one of the CDs into the box, shake his hand for a few times,WOW, the blank CD turns into red! He takes the other CD and put it into the box ,the CD turns blue! That is really amazing! 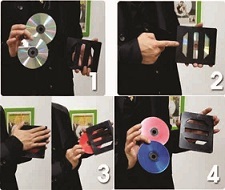 What is more, the magician put the blank CD into the box and shake this hands, the CD vanishes! That is unbelievable! The item includes 2 CDS and a box.